Being a parent can be tough at times, whether our children are grown adults of still in their years of adolescence. This reality becomes all too difficult when the issue of substance abuse and addicted children or teens arises. Although science has made extraordinary progress in the research on addiction, no one yet fully understands why some become addicted to a substance and others do not. However, there is data available that suggests an area of vulnerability that may place people, especially adolescents at risk. Working together as a family can have the best outcome in fighting back against drug and alcohol abuse. In a nutshell, drug and alcohol use alters a person’s neurological chemistry. Alterations that take place make stopping difficult and even impossible for those who want to stop. For this reason, exactly – addiction is a chronic brain disorder that is fatal if left untreated. Addiction employs and sustains a fierce influence on a person’s brain. This neurological influence unfolds in three separate ways, including the craving for drugs and alcohol, the inability to control one’s use, and continuing to use the substance despite experiencing many adverse consequences. Science best describes addiction by referencing other chronic diseases such as diabetes and heart disease. To be a bit more specific, diabetes weakens the pancreas, heart disease impairs the cardiovascular system and addiction hi-jacks and distorts the brain. Substance abuse is the starting point for a neurological rewiring process that occurs when a person becomes addicted. Use of substances that have addictive properties provides a short-cut to the brains reward circuit and floods the system with dopamine. Any recreational drug or alcohol abuse puts an individual at risk for undergoing a complete chemical re-structuring of the brain. Substance abuse is problematic, and it does lead to developing an addiction. Typically, a child’s first decision to do drugs or drink is voluntary. However, with the continuation of substance abuse, the ability to exert self-control can become undoubtedly impaired. The inability to control one’s drug and alcohol use is the fundamental aspect of addiction. 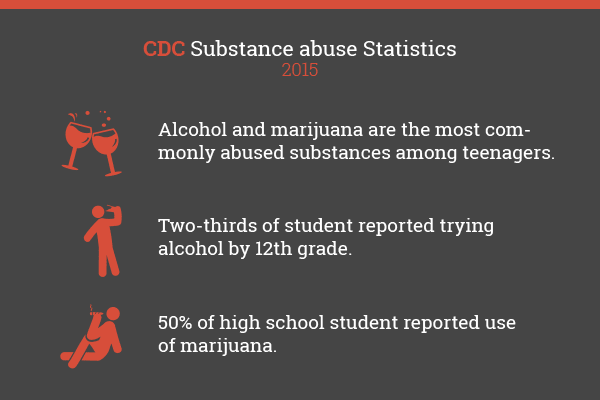 Reasons behind teen substance abuse can vary greatly. Still, there are several environmental, genetic, and social aspects that can contribute to destructive behavior that will eventually lead to the development of addiction. Teens who struggle with mental health disorders such as depression, anxiety, PTSD, ADHD and other emotional issues often self-medicate with use of drugs and alcohol. About 4.5 million underage people reported current binge alcohol use in 2016. In 2015, 276,000 adolescents were current non-medical users of painkillers, with 122,000 reporting addiction to prescription painkillers (ASAM, 2016). An estimated 92,000 adolescents age 12 to 17 report current misuse of stimulants; and 9,000 report use of methamphetamine. Approximately 23,000 adolescents reported regular misuse of sedatives for non-medical reasons in 2016. When looking for signs and symptoms of drinking and drug use, substance abuse, it is best to identify signs that are substance-specific. For example – signs of stimulant or opioid abuse. Signs of teen substance abuse vary from personal appearance, physical health, emotional state, cognition, behavior, occupational status, academic performance to normal habits at home. To sum things up, you’ll want to keep an eye out for physical, behavioral, psychological warning signs. If you have a suspicion that your loved one is on drugs, don’t second-guess yourself – you may be right. Individuals of all ages can experience the harmful consequences of substance abuse and addiction. However, teenagers are, particularly at risk. Teens who abuse drugs and alcohol often act out, struggle in school and many drop out before reaching high school graduation. 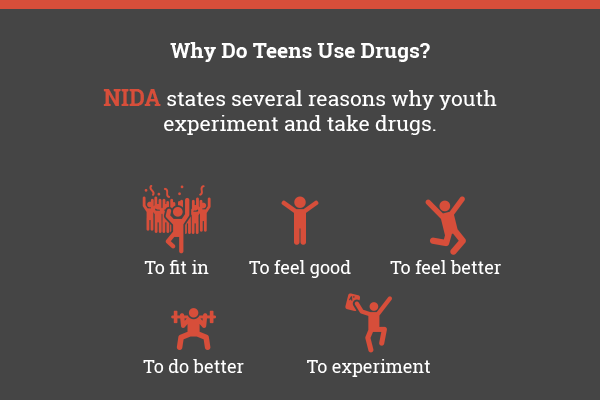 Because a teenager’s brain is still in its developmental stages, drug use can cause harmful long-term changes. One of the main issues of substance use among our youth is the significant increase in the risk of developing psychological dependence. The National Institute on Drug Abuse, NIDA shows images of brain scans done for research studies on addiction. The brain images show how individuals with addiction have physical changes in the brain. These physical changes take place in specific areas that are crucial to decision making, judgment, memory, learning, and behavioral control. The images presented clearly explain the disorder as well as the compulsive nature of alcoholism and drug addiction. Teen substance use should be identified and addressed quickly. Drugs and alcohol affect a young-persons brain entirely and can last a lifetime. The damaging effects often spread into many aspects of a person’s life. Substance abuse can also interfere with the family system, positive relationships with peers, and overall academic performance. In fact, many adults that have developed a substance use disorder, claim to have started using drugs or alcohol during adolescence. We want to stress the importance of identifying and addressing any substance use with an intervention as early as possible. If you are concerned about having an intervention on behalf of your teen’s substance use, seeking professional help may minimize stress. The NIDA reports state that annual medical visits are a great way to have your kid screened for any involvement in drug or alcohol use. Additionally, a health care provider can assess your teens status and provide resources to outside services, such as family counseling or substance abuse treatment programs. Talking to your teen in an aim of preventing substance abuse is important. Equally so – if you think that your loved one has a drug or alcohol problem, it is necessary that you sit down and talk with them. You may be wondering – what are some suggested punishments when you catch your kids doing drugs? If your teen is drinking or using drugs there are a few things that you can do to address the problem. Although it is necessary to speak up and discuss your concerns and offer support, it is critical to avoid a judgmental approach. Speaking up doesn’t always solve the problem entirely, so being prepared for denial of any claimed substance abuse is helpful. For parents – vigilance of any unusual behaviors and quickly seeking help for your teen is paramount. Even if your teen isn’t yet addicted, there are quite a few benefits that result from holding an intervention for substance abuse. Being afflicted by a substance use disorder can end up reality for anyone. The disorders level of severity can range anywhere from problematic use to the complete development of addiction. Fortunately, evidence-based research has allowed doctors and healthcare professional who specialize in addiction to provide effective treatment to those in need. Substance use disorders can be treated with success at any stage of severity as well as at any age. For teens -experimentation or not – the use of drugs or alcohol is a problem. Alongside experimental and recreational use of substances is associated with exposure to dangerous environments and people. Exposure to drug using environments at a young age is closely tied to an increase in risky behaviors and continuation of substance abuse into a kid’s future. Teens should be monitored and action should be taken if a problem is recognized. Parents – addiction must not be underestimated. When drug-taking behavior and isolation are present in your child’s life, you may benefit from reaching out for qualified help. If your family’s currently getting counseling services, working with the counselor can help considerably. Perhaps working with a family counselor is not an option. 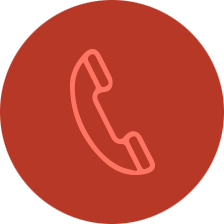 In this case, contacting a professional who specializes in addiction will provide guidance wherever it’s needed. An addiction professional can also help you and your family get in touch with a certified interventionist near you. Major life needs are the fundamental aspect of a child’s health and wellness. 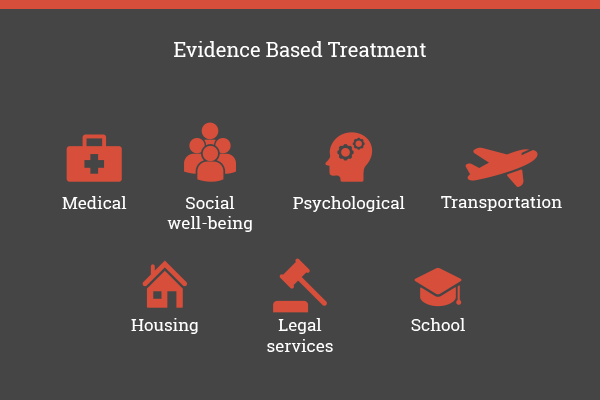 Treatment that meets these needs includes, psychological, social, medial, housing, transportation, education, and legal services. Adequate and quality treatment services consider the stage of development in adolescence, gender, performance in school, family relations and relationships with peers. Other factors vital to effective treatment are culture, ethnicity, the surrounding community and any distinct behavioral or physical challenges present. Treatment must attend to all the needs of your child. If the care he or she is getting solely focuses on the problem of substance abuse, you are not receiving quality care. The best method to treating addiction involves support of the teen’s greater life needs. Feeling pressured by the family plays a necessary role in treatment entry for teenagers. Similarly, family pressure and support assist in a loved one remaining in rehab for addiction treatment until completion. It’s essential to understand that most children with substance use or alcohol use disorders don’t reckon they need treatment; And in turn, won’t seek help on their own. The number one goal of staging a family intervention is getting your child or teen to see the problem and accept treatment. When interventions are staged with the aid of a trained specialist, techniques are used to move the meeting in a fluid and effective direction. One of many techniques used by interventionist is motivational interviewing. By using motivating interviewing during the family meeting, your loved one will be more open to acknowledging the problem and accepting help. Ideally, it is best to find mutual ground and understanding with your child, however, this is not always the case. 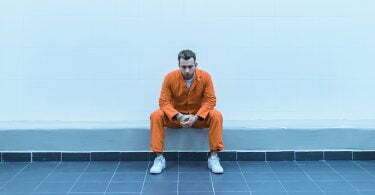 Sometimes individuals with addiction are resistant and unwilling to get help. During adolescence, your child is a minor. Therefore, willingness and agreeance to treatment isn’t necessarily a game changer. According to NIDA, studies have shown drug treatment can still be effective if admission is involuntary. When your teen comes home from drug and alcohol rehab, there are a few things you should keep in mind. 2. Relapse is part of the recovery process for many. Among teenagers who engage is drug and alcohol use, mental health issues are common. Effective treatment for addicted children requires the identification and treatment of any overlapping mental health conditions. Teens who abuse substance need to be screened for psychiatric complications. Moreover, treating psychiatric problems requires integration into the treatment for addiction. Monitoring drug use is important not only at home- it’s needed in substance abuse treatment as well. It isn’t uncommon for teens in recovery from addiction to experience a relapse and return to drug using behaviors. Triggers are the onset of a relapse back into active substance use. Some triggers include mental or emotional stressors and socializing with old drug-using peers. If a relapse goes undetected, the consequences can be great. In the event of a drug relapse, your teen will probably need additional treatment services or an adjustment to his or her individualized treatment plan. Loving a drug addict is challenging. It also presents a countless number of unexpected problems– which we understand completely. Despite the challenges, as a parent, it’s of paramount importance that you are available and supportive of your child’s recovery. To truly support your child’s recovery from addiction, you’ll need to consider all the aspects of care for effective addiction treatment. Research emphasizes the importance of staying in treatment for an adequate length of time. It also stresses the importance of continuing care after the program is complete. Short-term treatment lengths ultimately depend on the severity and types of problems your child is experiencing. Additionally, studies show that outcomes are more positive when the length in treatment is at least three or more months. Due to relapse being a frequent occurrence, more than one stint in treatment is usually needed. Children who have substance use disorders do benefit greatly from continuing care after treatment. Continuing care includes participation in services such as drug testing, home visits for follow-ups, and family integrated services. 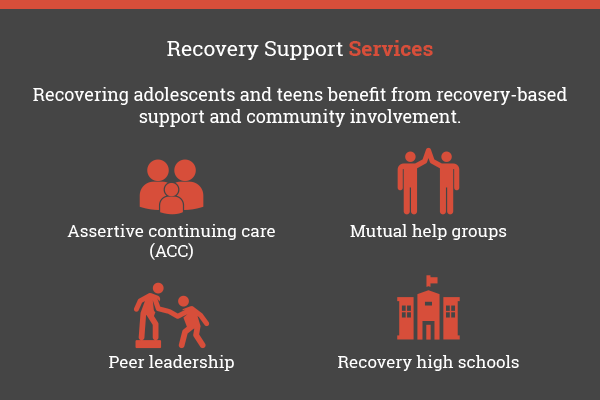 Having a healthy support system is a key component to treatment effectiveness and a teens recovery from drug addiction. Family and community are indispensable aspects of treating children and teens with substance use disorders. For recovery, the support of family members is crucial. 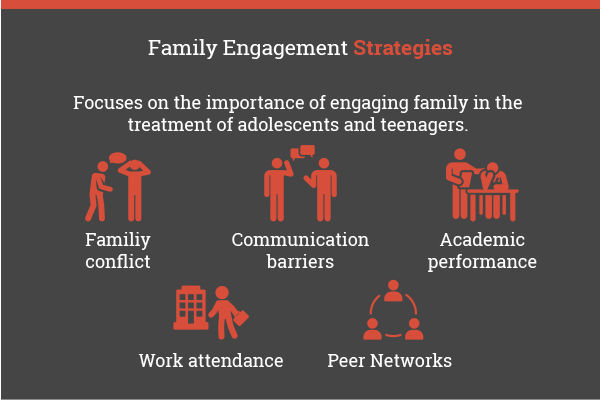 There are several evidence-based substance abuse interventions for adolescents that focus on healing family relationships. Healing relationships will involve supporting the recovering individuals’ abstinence from drugs and alcohol. Moreover, strengthing family ties results from improving overall communication among members. The aspect of community is also an important part of recovery from addiction in adolescents. Community members including but not limited to school counselors, peers and mentors can encourage youth who need help with substance abuse and addiction to get the needed treatment. A great amount of empowerment and healing result from community support during the individual’s journey through and after treatment. If your teenager is having problems with drugs or alcohol, family involvement is crucial and should take place as soon as possible. Substance abuse is not something to take lightly and getting family counseling is a good starting point to tackle the problem. Family counseling that focuses on teen behavioral issues is an available option. Counseling for the families engages everyone, including parents, brothers or sisters as well as anyone close to him or her. Given teenagers generally, live with a parent(s), he or she often is subject to parental rules, controls and even support. 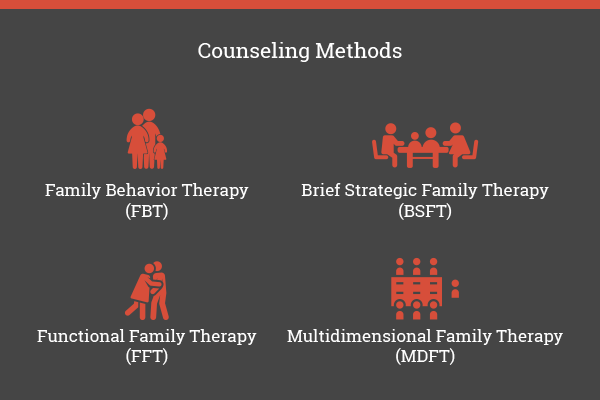 Family counseling provides therapy that touches on a wide range of issues in addition to the concerning substance use. Matters addressed in sessions mostly include familial communication patterns and household conflicts as well as any co-occurring mental health, learning, and behavioral disorders. At the same time, counselors involve subjects such as concerns with school or work attendance and peer influences. Thanks to research focused on addiction and families -there are several family-based treatments utilized in therapeutic counseling today. Behavior therapies for teens are known to be effective in addressing drug and alcohol use. 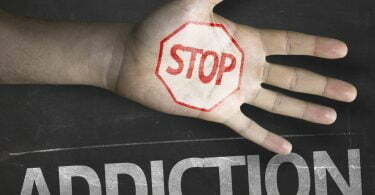 Therapies are provided by clinicians that are trained and specialize in adolescent addictions. Therapy can help teenagers refrain from drug use through the use of intervention techniques that strengthen an individual’s overall motivation to change. 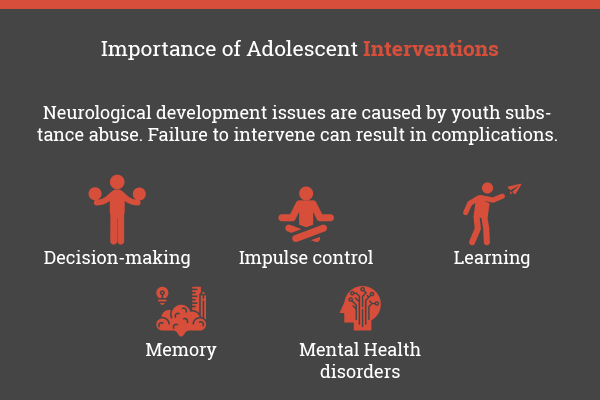 Behavioral therapies for youth are often coupled with incentives for remaining abstinent from substances, relapse prevention skill building, coping with drug cravings or triggers, improving problem-solving skills, enhancing interpersonal relationships and replacing substance abuse with beneficial and constructive activities. Behavioral therapy methods proven to be most effective for treatment of adolescents include group therapy, Cognitive-behavioral therapy (CBT), Adolescent Community Reinforcement Approach (A-CRA), Contingency Management (CM), Motivational Enhancement Therapy (MET), and 12-step Facilitation Therapy. Continuation of family therapy and supportive efforts its crucial to long-lasting recovery from addiction for adolescents and families. Recovery from addiction is taxing on everyone in a family and the development of healthy family dynamics doesn’t happen overnight. Family therapy can help the family and your addicted child to be proactive in healthful living and in communication with one another. Aside from family therapy and counseling sessions, there are support groups available for the parents of addicted children and teens. Groups such as Parents of Addicted Loved Ones -PALS, Al-Anon and Nar-Anon are places to find outside support. If you’re a parent of an addict, your quality of life will be contingent on the actions you take to help yourself. Support groups that are 12-step based or not can help you learn to cope with emotions as well as your child’s addiction. As a parent, having to deal with a child’s alcoholism or drug addiction is emotional, mentally, and physically draining. The exhaustion that goes with trying to help an addicted loved one quickly leads people to burn out. Getting involved with support groups with other parents who’re experiencing the same issues can give feelings of comfort and validation. Even though you might feel helpless and alone, you’re not. Getting support can help you make necessary changes that’ll ultimately give you the ability to handle your situation and your emotions in a more constructive, healthy manner. I remember growing up, a lot of the teens I saw already becoming addicted to drugs, actually came from really happy families and didn’t have mental health or trauma issues. I guess some just take experimentation too far. Seems like they were the ones doing the peer-pressuring as well. This is such an amazing resource and I’m so lucky to have found it. Do you have any recommendations on how to talk to teens about the genetic elements of addiction that doesn’t make it seem like you are excusing addiction or just expecting it to inevitably happen? Suggested punishments are cool and awesome, not taking it to the extreme but I think more preventive measures to drug and alcohol addiction would be more appreciated than finding a cure to it because of the tenderness of these kids. Hello. Very interesting content but it’s hard to find findrehabcenters.org in search results. Being a younger person, I’ve already seen so many people falling into addiction and treating it as if it was funny or trendy instead of a serious health issue. Resources like this are essential and I wish more young people are paying attention to the dangers of the behavior they are engaging in.